Este apartamento nível mais baixo é em um edifício pequeno Boutique. A um quarteirão do Centro de Convenções e do Centro de Convenções Metro. É perfeito para o cliente orçamento que não vai comprometer a localização! Você pode caminhar até a Casa Branca e os monumentos! A apenas 20 minutos a pé até a Union Station e do Capitólio dos EUA. O Banco Mundial eo FMI estão a 15 minutos a pé! Ele foi reformado recentemente de proa a popa nos últimos dois anos com CAC. Layout de estúdio com cozinha grande e sala de estar com área de jantar. Com um índice de walkability de 98%, não há necessidade de um carro. Carro Zip, parte do carro é um mero um quarteirão de distância, bem como um privado (pago por dia) estacionamento. Aluguel de bicicletas @ Capital da bicicleta Share. Caminhe até a Union Station ou o Captiol EUA em vinte minutos. Você pode caminhar até o moderno Penn Quarter Area ou Chinatown em quinze minutos. Não se esqueça de parar com a National Portrait Gallery ou o Verizon Center ou talvez uma peça no Teatro Shakespere? Deve andar através do quarto para acesso banheiro. O estacionamento é na rua e requer uma licença de US $ 75 bom para a duração da estadia. Nós provemos: -Toalhas -Linens (cada cama recém feita para sua chegada) -Xampu -Condicionador -Body-wash Cozinha totalmente equipada Pack and Play, cadeira alta, disponível mediante solicitação. 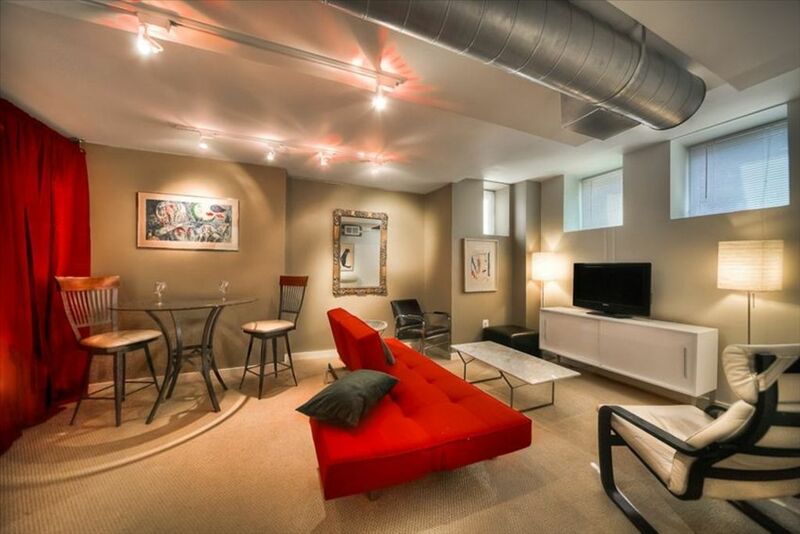 This basement apartment has the essentials for the everyday traveler. It's located just outside the busier areas of downtown but within short walking distance to most places. At no point did any of us feel unsafe, even when walking home late at night. We tried to check in early and never got a response from an email sent a few days prior but after physically attempting entry we were able to. The beds were very comfortable, the futon was pretty standard but a little wobbly. The lighting was dim, but if you aren't spending much time in the room it's adequate. Aesthetically the carpet is the worst offender, it needs to be stretched as it's beginning to fold up on itself in quite a few places. However, it was clean. It did not seem musty to any of us and the temperature was well controlled which was different than what recent reviews reported. However they were right about sound bleeding through from the apartment above us. Anything louder than a sneeze could be heard. Overall this was a budget friendly choice and I think if you can overlook some of the aesthetics and lack of responsiveness of the managing staff you'll be satisfied with your choice. The owner had really poor communication. There was either no response to questions or terse, grammatically confusing responses. We needed to change our departure date to leave one day early. I tried to contact the owner. There was no response for days. Then the owner said we were to late to get our departure changed. We had to pay for an extra day. The property is no where close to in-and-out parking. The closest was one mile away. The pictures are nicer than the unit. The property is very poorly ventilated-making It musty. The lighting is also minimal. Located in a basement, it is a bit dark. One of the two windows was broken at the seal allowing in cold air. The temperature was well below freezing during our stay. This made it cold in the family area and extremely hot in the back bedroom. We are not in the habit of staying in high priced accommodations. I don’t think our expectations are exorbitantly high. This property was really underwhelming. The owner’s sporadic, late, terse, even rude, communication was the worst part of this rental. The apartment is a basement apartment. There were only two windows in the whole place and the view you had were of feet walking past the window. The lighting was terrible, the washer/dryer didn't work properly. The management guy wasn't too nice. Most importantly, the tenants above were horrible... they were running up and down until 1 a.m. almost every night we stayed. I had to go walk outside and then into the actual apartment building to knock on their door to ask them to keep it down. We ended up leaving a day early. I wouldn't recommend this place to anyone with a family. Your best bet would be a Hilton or Marriot, which is closer to the museums and has onsite admin to deal with any disturbances. We would never stay at this rental again! When we first arrived to this unit, it smelled horrible. We contacted the property manager by phone and were told that we had a sensitive sense of smell and were reminded that it was a basement. We are from a large city so we are use to a wide range of smells and from an area that having a basement is standard. I actually have a horrible sense of smell, but definitely knew immediately the smell of must. We quickly found that the carpet and pad were wet in the dining table area of the kitchen. Someone from the property management supposedly came the morning after arrival to check while we were gone, but found nothing wrong with the carpet and no smell (still not sure how). Unfortunately, it rained the first two days we arrived which is what made the smell worse. If you rent this place, hope that it doesn't rain before or during your visit. Maybe why the carpet is different from the pictures posted (carpet is now darker) and carpet coming up is noted in a previous review. We would get back from a long day of sightseeing to a horrible smelling place to relax. My kids would have to hold their noses. If my husband and I tried to relax in the back bedroom, we would both get a horrible headache. We requested a fan, by email since that is how they told us to communicate, but never received a response or a fan to help dry out the carpet and ventilate the back bedroom. The back bedroom has a foam mattress which is very uncomfortable and hot. I ended up sleeping on the futon in the living room area with one of my kids. The back bed area also has no windows or outside door, which does not allow for any ventilation. Also, no escape if there is a fire. Luckily there are fire sprinklers. The shower rod in the bathroom is completely rusted on the bottom. The only good thing about this place is the location. Near the metro and some good restaurants. We ended up leaving a day and a half early and informed the property manager by email. We never received a response. This rental definitely put a damper on our vacation. The apartment was clean, beds were comfy and the kitchen was stocked with all equipment we needed. Washer and dryer a plus. The location was convenient to so many things - less than 20 minutes to either walk or hop on the metro and get anywhere we needed to go. Keyless entry made it easy for three of us heading in different directions every day. The biggest negative was the lighting. It is a basement apartment so dark but there needed to be more lighting. Bathroom lighting was particularly poor and no counter space with if that matters to you. As encomendas diárias não requerem um carro. Transporte público de classe mundial. Flat como panqueca, excelentes pistas para bicicletas.